Achieving straight smooth cuts in plywood sheets will depend on the tools available. You will at least need a good quality handheld power saw and a straight guide. A good quality sharp blade will be an advantage. Modern professional hand power saws are made to run on specially designed saw guides which have tracks to guide the saw, instead of a straight edge that acts as fence. These guides will give very good results and are easier to use than a traditional straight edge because, in addition to the saw running on tracks, the guides are designed to easily clamp in place and usually have a non-slip under surface. Movement and slippage of saw guides is the most common point of failure when using them. The second most common source of unsatisfactory results is misaligning the guide initially and is often because of small movements of the parts as the guide is clamped into place. Observe the golden rule: “Measure twice or thrice – cut once.” In this case, measure before clamping the guide into place, and again after tightening the clamps (use clamps, not spring clips!). Again, if you have any doubts, measure right before pushing the saw more than an inch or so into the material. 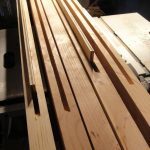 In wood shops, most plywood sheets will be cut on a table saw. However, this presupposes an existing straight edge on one or other side of the sheet being cut. In most cases, of course, this will be present. One straight side acts as a guide to cut the other. In the absence of an existing straight side, one will need to be introduced. 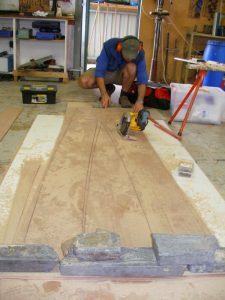 Usually by adding another piece of material, which has a straight edge, clamped on top of the first sheet. Full size panel cutting racks, as often seen in lumber yards and hardware suppliers, are deigned to cut only straight and at right angles. As long as they are kept in good condition and correctly adjusted, they will give consistent, acceptable results.